Today 22 May 2012 is a sad day at Wingdari. Our beautiful "Meg" died. "Meg" has gone over the Rainbow Bridge carrying her ball in her mouth. Every where Meg went she had a soccer or tennis ball and just wanted to play. Meg you will be sadly missed by all your mates. We have your beautiful offspring to always remind us of you. You are now at peace. "Meg" you will always be in my heart. "Meg" is a black tan with the correct markings, type, confirmation, movement and temperament. 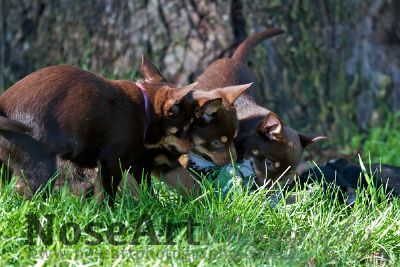 The red/tans have the same markings as the black/tans but with the red/tan colouring. One of the photos on Megs profile is of Jed-one of Meg and Drover's sons who is red/tan. Please go to my web site and look under puppies where you will see photos of black/tan and red/tan puppies from Meg and Drover's litter. "Meg" - well what can we say about this young lady! Full of life, feral, happy, easy going. Nothing upsets this girl. "Meg" has now been to three shows in baby puppy and has won baby of breed on all three occasions. Looking forward to a great show career with "Meg" - she is black/tan so it is going to be a challenge as some of the judges out there are convinced that the only colour is chocolate. Show them "Meg"!!!! 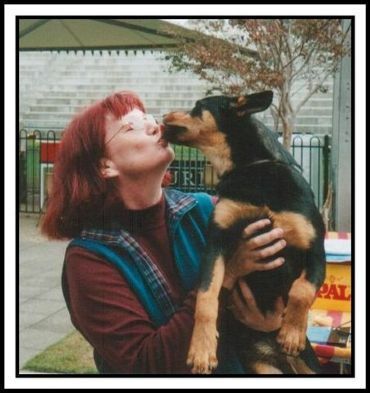 Meg qualified for the Puppy of the Year 2004 which was great to have a black/tan Kelpie be there and compete. Meg is the best soccer player-has her own soccer ball and can save the best goals!!!!!! Meg has been out of the ring and has produced some top red/tan and black/tan puppies. 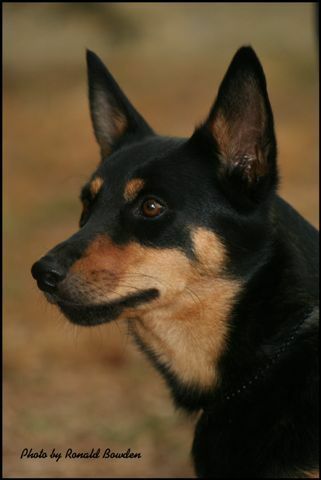 One such champion girl is "Sally" who is in South Australia being shown by Rosemarie from Firebear Australian Kelpies. Please refer to "Sally's" profile page - Sally is now an Australian Champion.